Create a DIY pillow using two rugs, a pillow, and some yarn for tassels. This large, heavy duty pillow is great for outdoors or as a floor pillow. For an added touch of style you can add braided tassels to the sides of the pillow. When I saw these woven rugs on the Target clearance rack I immediately knew they needed to be sewn together and stuffed with a pillow. For extra credit I made some braided tassels and added them to the ends of the pillow. This large pillow makes a great floor pillow or for outdoor lounging. Cut a piece of cardboard approximately twice the length of the final desired tassel length. Wrap the yarn around the cardboard 20 times. Carefully remove the looped yarn and knot at one end. Cut the bottom of the yarn loops. Divide the strands into three equal sections and braid. Make another knot and trim the ends even. These braided tassels have so many uses for home decor or fashion. Make enough tassels to line the side of the rug. Sew the tassels onto the backside of one of the rugs on each end. I sewed the tassels to the rug on my sewing machine. The rug was very thick and I went too fast resulting in three broken needles. Go slow or sew by hand! 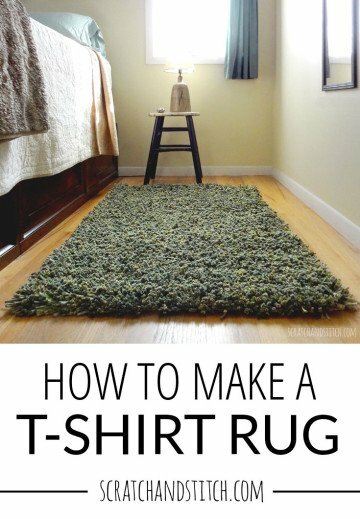 Layer the rugs with wrong sides together and sew three sides of the rugs together leaving one end open. Stuff the pillow in between the rugs. Finish up by sewing the other end shut. That’s it! Now you have a beautiful new DIY pillow to lean back on and enjoy. Have you ever turned rugs into pillows?